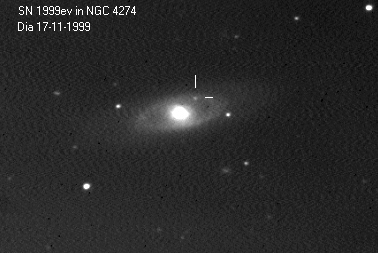 This page is devoted to information on Supernova 1999ev in NGC 4274 Basic information on this SN, including the last reported brightness, on this Supernova can be found on the main supernova page. Information on the original web pages for many of these images can be found on the Supernova links web page. 1999ev was discovered by amateure Tom Boles. NGC 4274 is a magnitude 11.3 galaxy in Coma. This one is a type II, and the expected maximum brightness should be around mag 14.1. CfA Spectrum Taken 11/10/99 showing a normal type II supernova past maximum light. Back to Bright Supernovae - 1999.